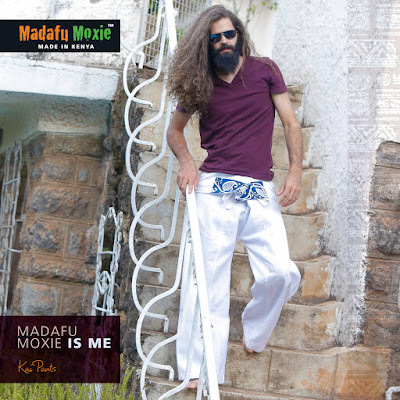 When did you start Madafu Moxie? 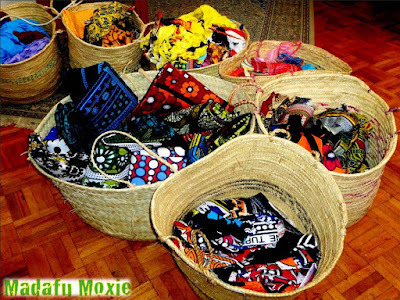 How did Madafu Moxie start? A few years ago, three girls were sitting at home and looking for ways to add character to our wardrobes – wardrobes that were filled with the same generic garb that everyone wore. We decided to revamp our existing wardrobe using bits and pieces of material lying around the house. Soon enough, we started receiving boxes of waste material from clothing stores and tailors – bits and pieces of African and Indian prints. It was fun to rummage through bags and bags of materials to pick out matching pieces. The end result is naturally a creation or piece that is one-of-a-kind, handmade and beautiful. To be an eco-friendly, environmentally conscious label that makes un-imitable one-of-a-kind pieces. We wanted to stand for something that would make a difference, not just be another ordinary fashion company. Our motive was not just clothing, but to be a bigger cause that would somehow benefit our world environmentally and create the right footprint in the fashion industry. What is the main inspiration behind the brand? 1) Comfort, while still looking fabulous. A general belief is that to look good, you have to wear something formal and fitted, or tight and uncomfortable. We challenged that by creating beautiful clothing that is versatile, flowy and easy to move in - so even though you are fancy and dressed up, you are completely comfortable. And because you know you look good and you're in something that drapes around you perfectly, you automatically exude confidence wherever you go! 2) Cultural history and experiences play a big part too. 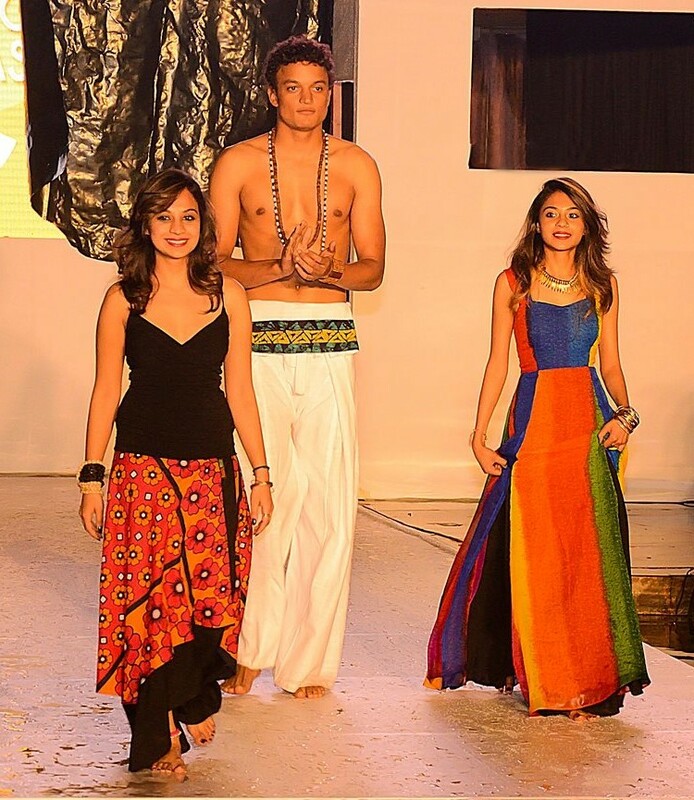 One inspiration is the land of my birth, Kenya, and the other is my Indian heritage. Both cultures inspire me through their warm, friendly people, and their beautiful landscapes. I am humbled by the opportunity to create pieces that hopefully truly represent both these cultures. 3) The need to refresh my OWN wardrobe was a big inspiration too! 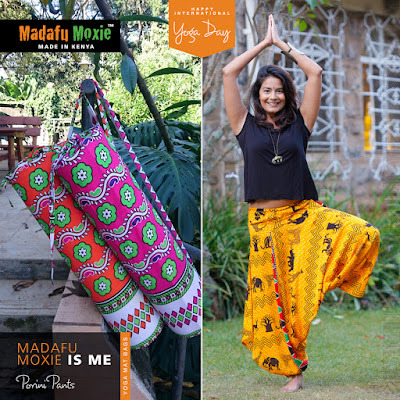 Where did the name 'Madafu Moxie' come from? After weeks of not being able to agree on a name, my business partner and I decided to pick one symbolic word each, and then put them together. Coincidentally, both words began with the letter 'M' and their meanings resonated with us. 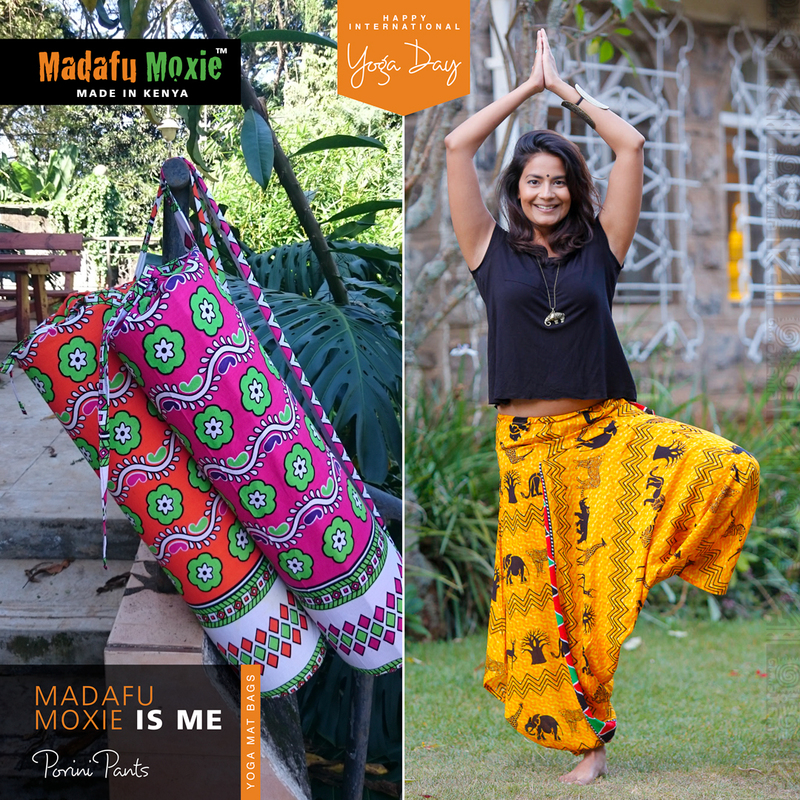 'Moxie' is slang for daring, courageous and spirited. 'Madafu' is Swahili for coconut and identifies our Kenyan origin and brings to mind beaches, cocktails and a fresh vibe. Together, these two words represent who we are and what we want to convey to the consumer. Who are the rest of your team members? How did you find them, and what do they do? Our team consists of four, including my tailors and my sister. One of our co-founders, Ash Pinero, has gone back home to Argentina - and she is definitely missed. 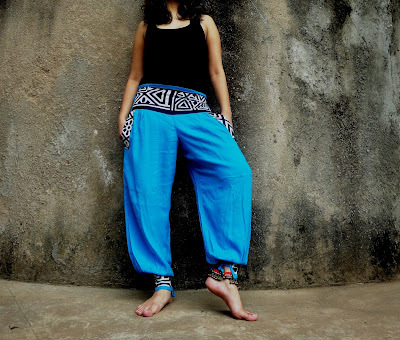 My sister, Deesha Raja and I design the pieces. She is also the stylist, and is great at creating looks, especially combining clothing and accessories for our photo shoots. I handle the business aspects, social media, and I enjoy the one-to-one client consultations and designing custom-made pieces and collections. Tell us a little bit more about the ethical fashion aspect of your brand. We are ‘slow fashion’ and believe in ‘pro waste reduction’. We therefore try to re-use or incorporate cut-offs as much as possible into our sustainable designs. For example, the hand-embroidered flower motifs on the Bliss Pants are made with pieces of material that would otherwise have been thrown away or burnt (releasing chemicals into the air and polluting air, water, or land). Another benefit of this is that no two pieces will ever look alike making them un-imitable and one of a kind - meaning - no one else will EVER own another pair of pants like yours! 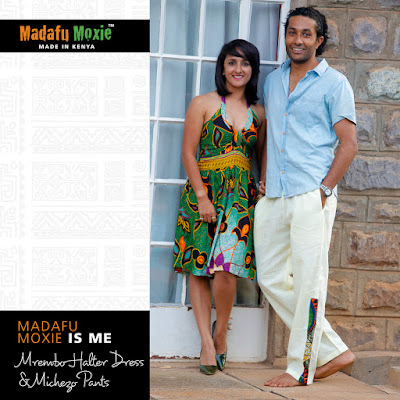 tailors continue their own businesses, while Madafu Moxie is their main source of income. We believe in empowering local women to be independent and work according to their own flexible timings so as to maintain their work-family balance. Madafu Moxie’s conscientious nature also supports causes such as ‘Nairobi Greenline’. 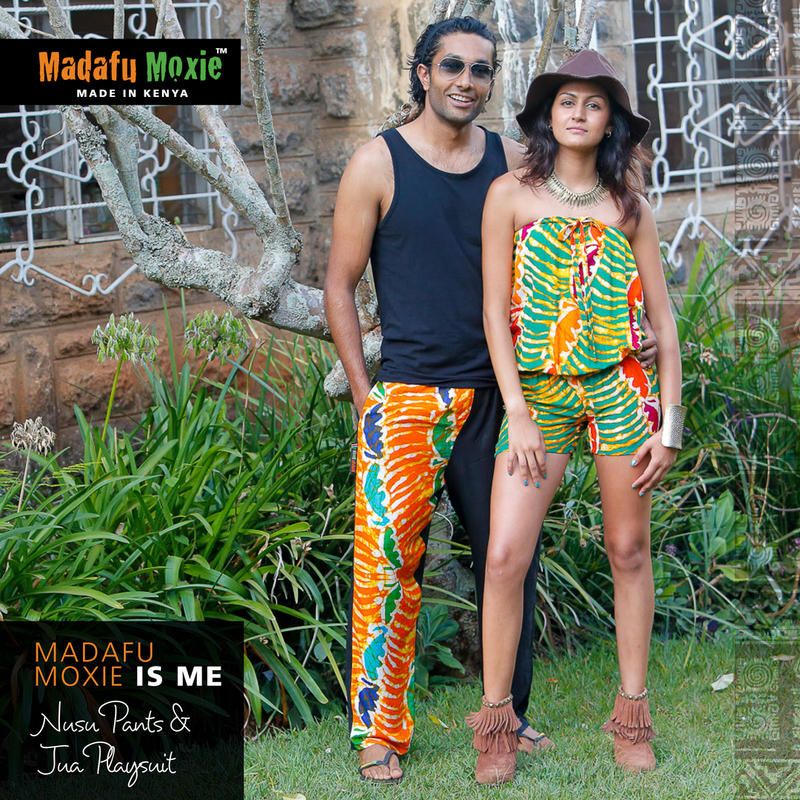 What is your personal favourite Madafu Moxie piece, and why?It's hard to pick just one favourite... but if I had to, I'd go for my olive green tie-dye Bliss Pants because I've worn them everywhere! 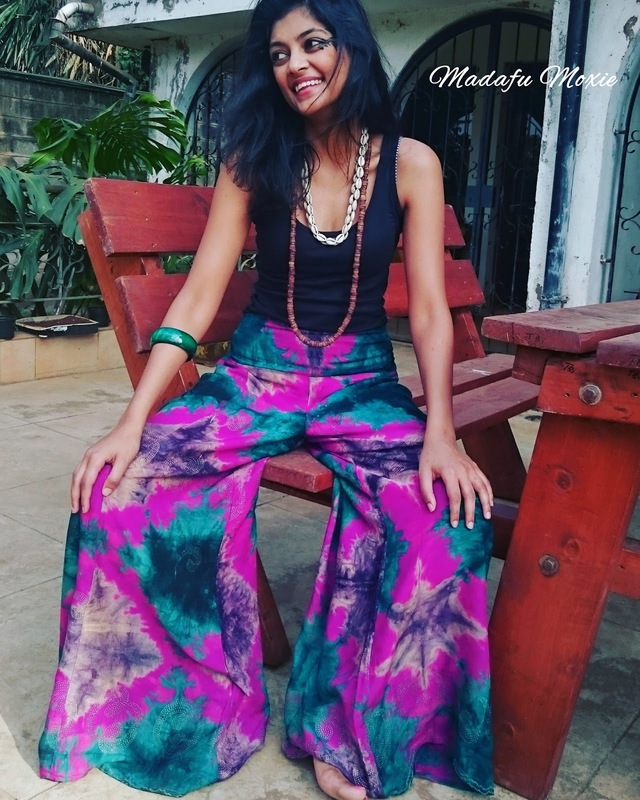 They are super wide palazzo pants and they blend perfectly into every setting, from beach parties to brunches to conferences to meetings. Yes, even serious affairs! 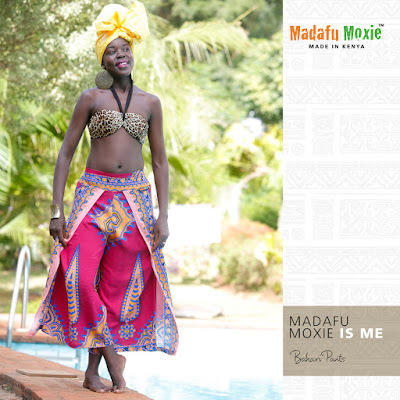 If you could dress ANY 3 celebrities in pieces from Madafu Moxie, who would those celebrities be, and what would you dress them in? I have already had the pleasure of dressing Kenyan Business Personality, MD, and Co-Founder of Marini Naturals, Niyati Patel, my friend and mentor. I can picture Lupita Nyong'o in the Bliss Pants with bold embroidery detail. She would carry them beautifully! Sonam Kapoor would look great in the Porini Pans - as a style icon, and 'best-dressed' female, I would love to see what top, jewellery and shoes she would pair them with! Her dress sense is on POINT. Muthoni the Drummer Queen would be a stunner in the Kidwe Dress or the Jua Playsuit - I love the energy she exudes, and her style is bold, distinctive and colourful. I absolutely love the thank-you calls and messages from happy clients, but what REALLY rocks my boat are the repeat orders! People like that we custom make pieces exactly to their body type and specifications, and they come to us regularly for their daily wear as well as special-occasion wear. 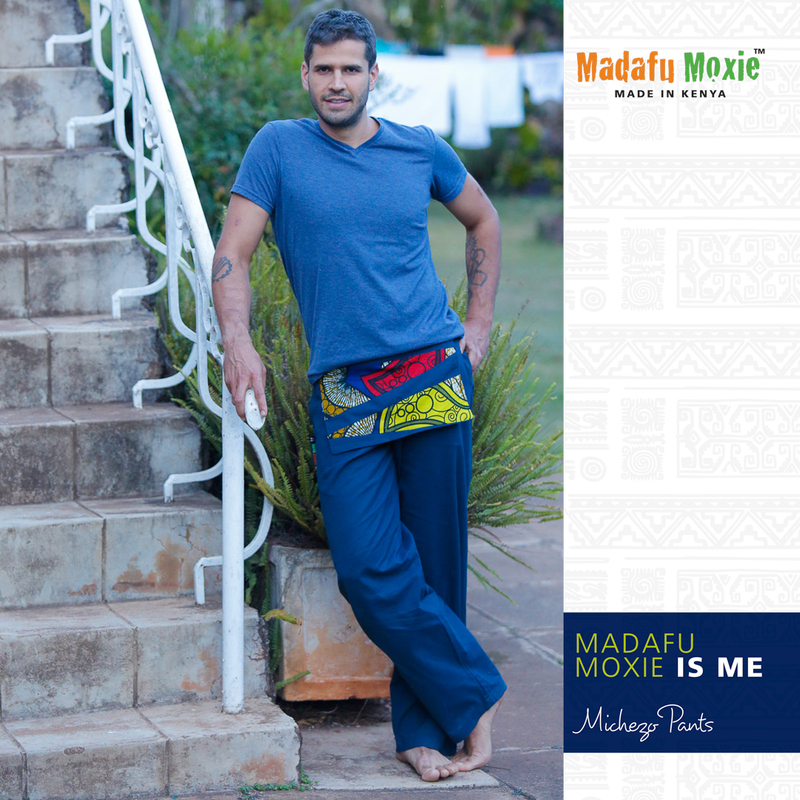 Who has been your biggest supporter along the Madafu Moxie journey? My sister-in-law, coincidentally also named Roshni, has shown me the ropes from the very beginning - we wouldn't be where we are without her. People do take me seriously, so I can't say I've had challenges specifically as a 'female' entrepreneur. But as an entrepreneur, the whole process can be daunting - raising capital, gaining credibility, and turning my business into a stable form of income. Grit. Never ending perseverance. And a strong support system. Any advice to (female) entrepreneurs who may be embarking on similar journeys? If you are passionate about it and do it for the sake of passion, then you will make money. If you do it only for money, don’t expect to see much. Build healthy relationships with your clients, suppliers, etc. Make a plan. Have clearly defined goals, timelines and set a detailed budget. Create a network with people in the same field as you, support and learn from each other, instead of putting each other down. Whatever You Think Think The Opposite, Paul Arden. This book has more pictures than words! That’s what sets it apart, and every time I experience a thinking block I flip through this. The River Between and The Alchemist, Paulo Coehlo – teaches you to think outside the box and to turn the curve balls life throws at you into opportunities. Also, I devour as many autobiographies as I can! To have more confidence and faith in myself. And I wish I had taken it more seriously as a business, and not just as a hobby. However, taking my time gave me a good opportunity to test the market and gauge the demand for Madafu Moxie clothing - it was definitely positive! Worn by people from every walk of life, in every corner of the globe. Where does one go if they want to buy some Madafu Moxie pieces? Currently, you can purchase or make an order over the phone or through email, our social media pages, or you can visit our workshop. In the near future we will be stocking our products at a few outlets around Nairobi – Wasp & Sprout, Spinners Web, The Arbor and Republi.ke stores. Keep an eye out for our stockist updates on social media. 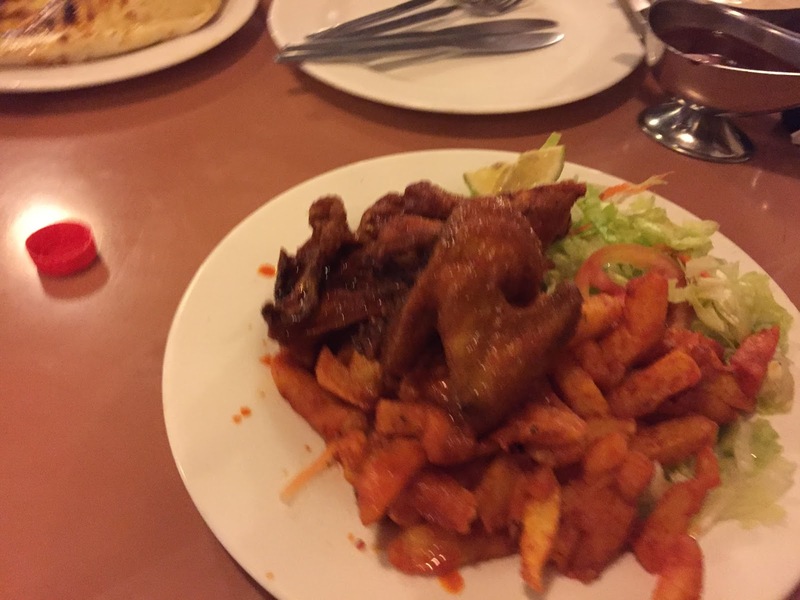 Do you really even live in Nairobi if you've never been to Hashmi and raved about its food to all you know? Yes, I'm being (mostly) serious. I can't remember the first time I went to Hashmi - only that I've been a regular customer for more than half of my life. Nowadays, we order in more than we actually visit, just because they're always so busy. 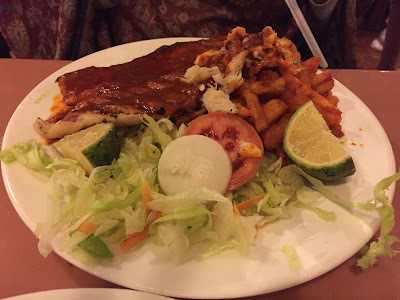 However, I took some days off earlier this month, and decided to take my mum on a mummy-daughter lunch date to the restaurant - I knew the food is amazing, but I wanted to see if the rest of the place lived up to the hype. Location wise, Hashmi is in the Nakumatt Ukay complex - convenient, but depending on the time you go, potentially tricky to get parking. Side note: If you're reading this, I REALLY hope you're not one of those people who parks ON THE ROAD instead of the designated parking that's just a short walk away. Anyway, back to Hashmi. Ambience wise - including interior and music, unfortunately, the place isn't great - but the food does MORE THAN make up for it. This particular Tuesday, Mum and I headed there a little early to beat the lunch rush, which turned out to be a great decision! By the time we were leaving, there was near-to-full occupancy. The waiter came to take our order pretty quickly, but I was a little confused as to why he hovered around at our table as he waited for our orders. Perhaps he's used to people who know what they want right away? I asked him to give us two minutes, which is when he stepped away. 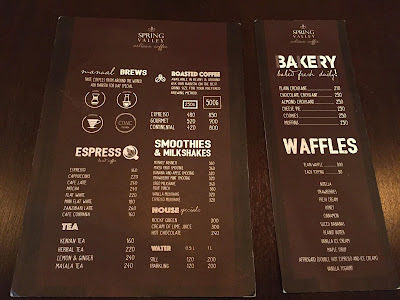 For those of you wondering - yes, I do know the Hashmi menu pretty well, and yes, I did order one of the two things that I usually do, but still, I always like reading the menu! Mum ordered the pili pili fish, I got the poussin chicken, we got a butter naan to share, and we both ordered cokes (which were, unfortunately, nowhere near cold enough). When the waiter brought the cutlery, he unfortunately placed them face down on the table - not the most hygienic, so we asked for a fresh set, and luckily, this time they were brought in a plate. The fish was fresh - could've been crispier, but the flavour was perfect. I remember a time about 12-13 years ago (yikes I feel old) where this dish would be ALL I'd ever order at Hashmi. One of the things I like best about Hashmi is their consistency. Eating their food is like a trip down a comfortable memory lane, because it's been there as I grew up. The chicken, as usual, was great. 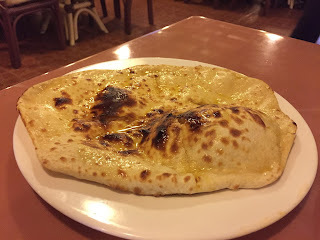 I absolutely LOVE their poussin sauce - it goes on everything, including my chips and my naan (sometimes I like just the naan and the sauce), and I have NO clue what they put in it. The chicken was soft and cooked well, but perhaps could have had a tad bit more flavour permeation. If you haven't yet tried their poussin sauce, please do! It's a perfect explosion of flavour in your mouth, and you'll be left wanting more. Now, as everyone knows, Hashmi makes the best naans in Nairobi, hands down. Just LOOK at all that soft, buttery goodness! Literally yummy enough to eat on it's own, its melt-in-your-mouth goodness should be proclaimed one of the wonders of the world. Overall? 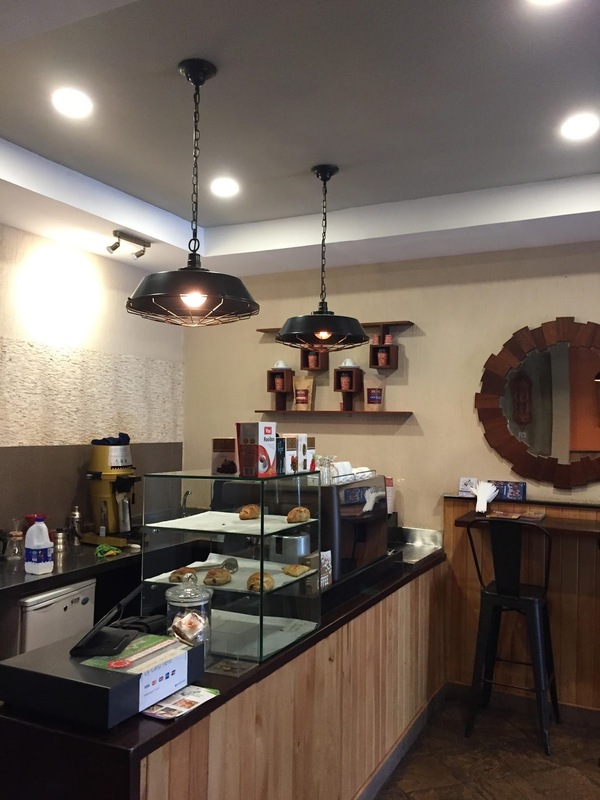 Their food is fantastic, and you absolutely NEED to try it out! However, if you were to order in as opposed to actually going to the venue, you may not miss out on too much - and then you can pop open a bottle of something good and not have to worry about driving/parking! It's a cold winter here - for Nairobians, at least. Stormy weather, cloudy skies, the occasional downpour - you get the picture. 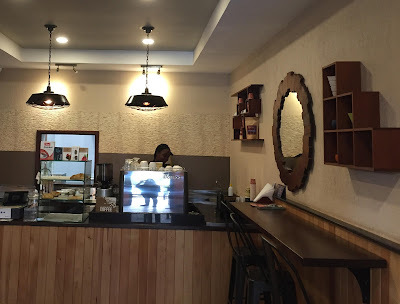 I took a few days off work, and thought that it'd be perfect weather to head to one of my favourite coffee & waffle joints for breakfast with my sister - and finally get a review in. The place is owned by two friends - but don't worry, I made sure to make this review as unbiased as possible! 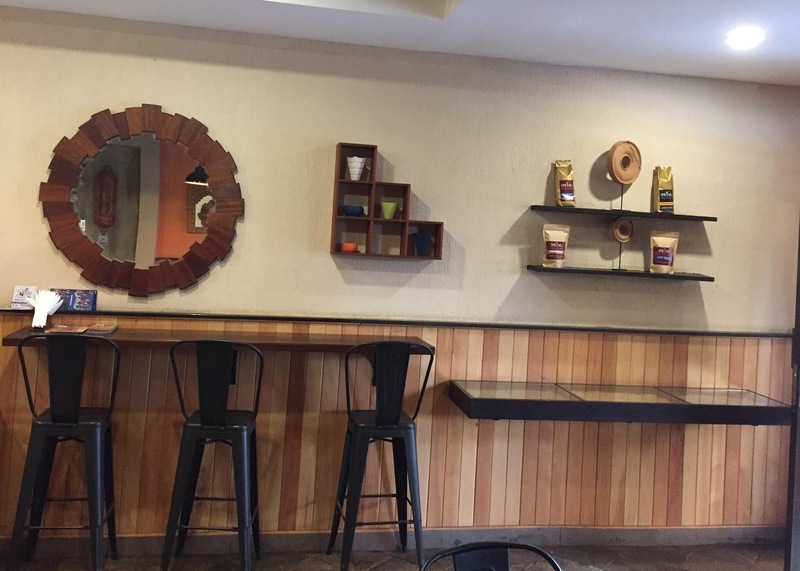 Tucked away in a little corner at the Spring Valley Petrol Station on Lower Kabete Road in Nairobi, you may be forgiven for not realising that there's a cafe in there. In fact, the location may be one of the only complaints I have - not because of the way it looks, but because of the difficulty in finding parking. (Luckily for all of us, they'll be opening up another branch soon, so that should take care of vehicular woes!) Their coffee is already quite popular in Kenya, with the cafe almost being a 'side' to that. The decor is chic and eclectic, perfectly suited to a rainy day - and with the opportunity to actually buy some of the pieces! 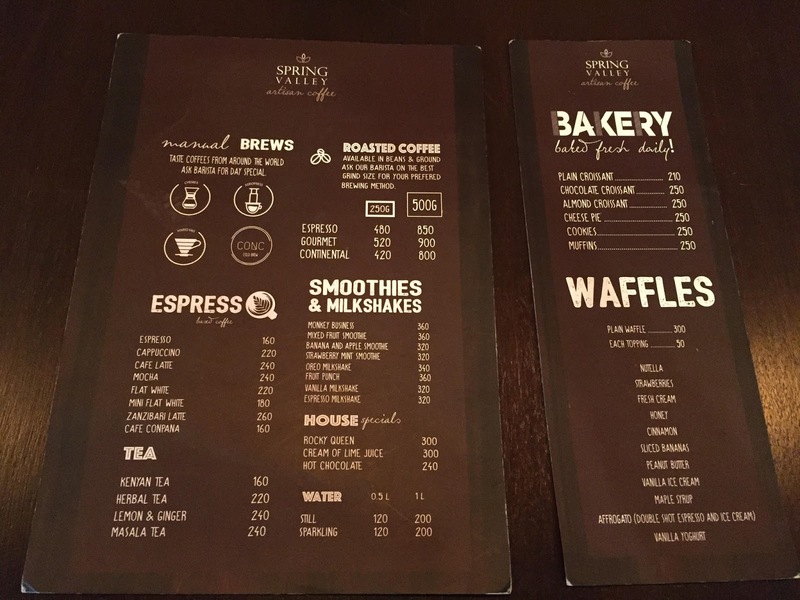 Their menu is heavily focused on coffee and waffles (as you can see below). Lots sounded tempting, but alas - we had to choose. 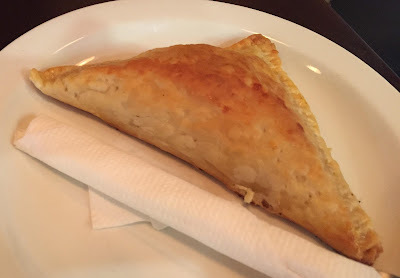 Sitting down to breakfast, I noticed that the only savoury item on the menu is the cheese pie, so perhaps adding more savoury for those among us who don't eat as many sweet things may be a good idea. My sister chose a cappuccino while I went for the latte - and to eat, she chose a cheese pie, while I went for a waffle (no surprises here) with strawberries and maple syrup. 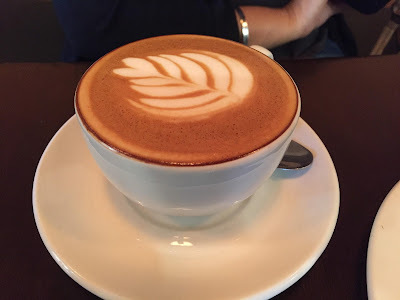 My sister loved her coffee, and said that it had a perfect aroma! 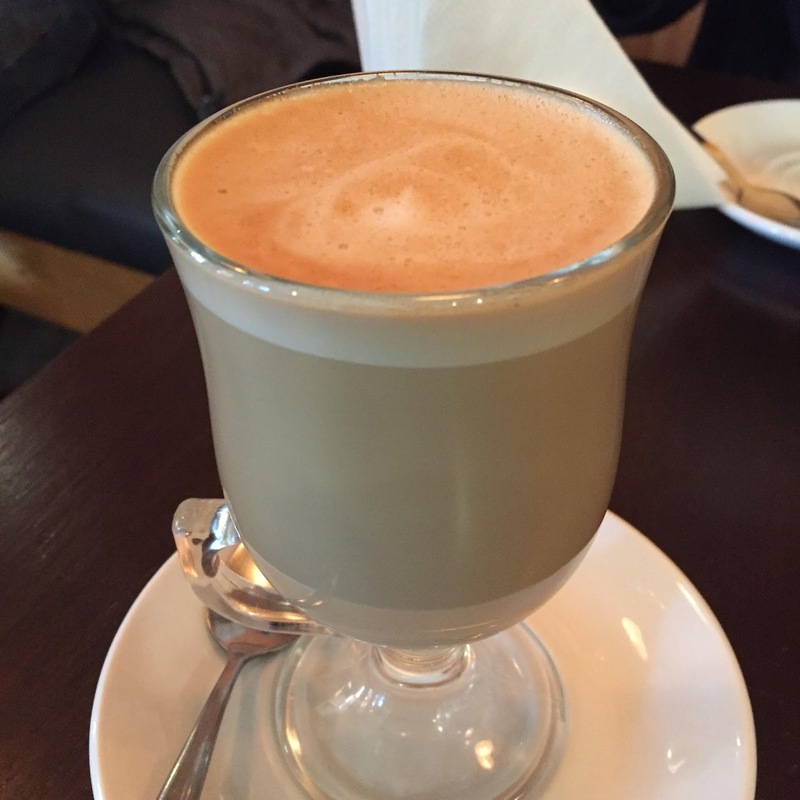 I felt similarly about mine, and honestly think that it's one of the best lattes I've had in (or around) Nairobi. Weirdly enough, while drinking that coffee, I got that 'comfort food' feeling - coupled with the cold weather and the jazz playing in the background, this meant that I went righhhht back to bed for a lovely nap after this breakfast! Now for their waffle. Oh. My. Goodness. Crispy but still fluffy enough, sweet but not sickeningly so, flavoured with the goodness of cinnamon - this waffle had it all. I'm salivating just writing about it! I honestly think that their waffles are the second best in Nairobi - and the best for vegans! 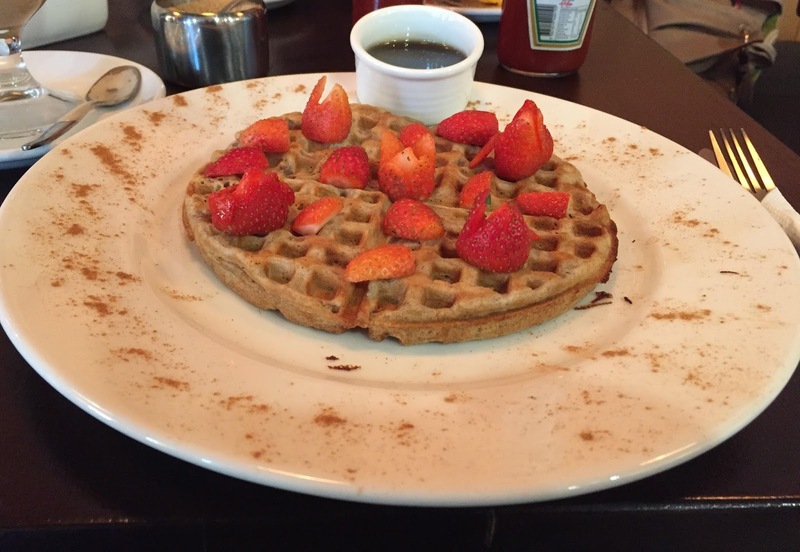 Oh yeah, did I forget to mention that their waffles are vegan? Overall verdict? If you haven't been here yet, you're definitely missing out! If you have, you probably have a smug smile on your face right now because you're in on the secret. Despite parking woes, the location is extremely convenient, the service is fast and friendly (if a little shy :) ), the food is great, the coffee is even better.... do I need to go on? Liked this post? Let me know! Feel free to comment, like and share below!